Chess helps boosts ​MATH grades!!!! In several studies, national and abroad, have found Chess to enhance creativity, concentration, critical thinking skills, memory, problem-solving skills, cultural enrichment, intellectual maturity, self-esteem, and promote other positive traits. 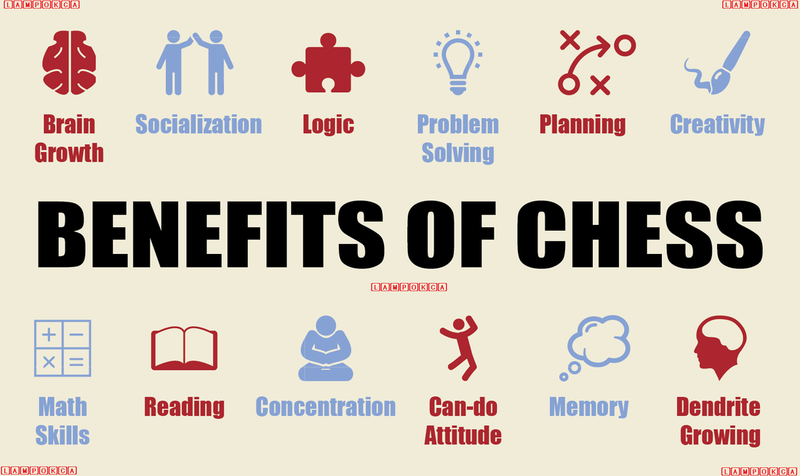 ​ Improves Concentration and Memory According to studies done at the University of Memphis, playing chess significantly improves children’s visual memory, attention span, and spatial-reasoning ability. Perhaps that’s because, in chess as in school, concentration and memory go hand in hand. In order to play well, you have to focus completely on your objective—capturing the opponent’s king. As you constantly visualize the board, its pieces, your moves, and your opponent’s every possible counter move, your power of concentration grows. As your concentration grows, it becomes easier to memorize past games and classic strategies. Enhances Reading and Math Skills With its focus on problem solving and move variables, not surprisingly, chess can improve a student’s math skills. However, numerous studies show that chess improves reading skills as well! In separate multi-year studies of elementary-school-age children in Texas, Los Angeles, New York, Pennsylvania, and Canada, researchers found that students who played chess showed more improvement in reading and/or math assessment scores than their non-chess-playing peers. A Venezuelan study even found that playing chess increased students’ IQs! Fosters Logic, Critical Thinking, and Creativity Chess favors the “if–then” thinker. “If I move here, then my opponent may move here, here, or even here.” That’s logic and critical thinking in action! But studies also show that chess boosts creativity, most dramatically in one specific area—originality. In a four-year study of students in grades 7 to 9, researchers found that playing chess increased original thinking more than two other creativity-training activities did. Why? Researchers theorize that by encouraging students to imagine all possible move alternatives, chess trains the mind to play with possibilities, which is a cornerstone of original thinking.